Goodreads Summary: What if your worst enemy turned out to be the best friend you ever had? As a singer myself, I've wanted to read this book since I first heard about it. Even without the description, the cover alone would have drawn me to this book. Having witnessed firsthand how deeply rivalries can run between singers at the college level, I was very curious to see how this drama would play out in a high school chorus setting. Kathryn has become a social outcast thanks to Brooke. Since Brooke punched her junior year, tensions have been high, and this is not helped by the fact that they have to see each other in choir every day. This rivalry only escalates as the Blackmore competition approaches; jealously and fear of secrets coming to light seem to be a constant state of being for both girls. But in the midst of this, they both cannot help but remember their junior year and the evens that led them to dislike each other so strongly. In fact, Rival alternates between both girls' points of view, as well as between memories and the present day, which really show this contrast and brings the reader deeper into the world of both girls. I loved getting to know Kathryn and Brooke, and I could sympathize with both of them. Kathryn longs for the things that she has never had - popularity, money, the chance to really be seen - and Brooke is caught between what she wants and what everyone expects of her. I would say that these two aren't your typical high school girls, but they are; however, they are not the stereotypical girls found in so many stories. Instead, they both have their moments of goodness and their moments of poor decisions. Sometimes I was frustrated with them, but everything seemed so familiar from my own days in choir that I felt that I was attending school right along with Kathryn and Brooke. I also enjoyed the scenes in which Kathryn and Brooke discussed music and opera. However, these conversations were not so predominant that someone who is not a singer couldn't follow them. The Blackmore competition may have been the driving force behind many of the events and the reminiscing, but it was not always the focus. However, the competition is part of the story, and while I was slightly surprised by the competition results and the ending of the book, I felt that it was both realistic and the way things should have been. 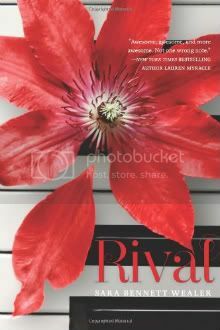 In Rival, Sarah Bennett Wealer has spun a story that is so realistic and engaging that you can't help but be drawn into it. Despite the frustrations, I had to know if Kathryn and Brooke would be okay after all was said and done. I will look forward to reading what Wealer writes next! Interesting story and super review!! Seems like there is always some kind of Rivelry between girls in school. Loved that you could relate to it so well!! I should read this book, since Amber will be going into choir this year, she has already experienced a little bit of this. I have been spreading the word my friend about your new blog! !